A refreshing article on feeding children recently appeared in the pages of Newsweek. Titled “Not Hungry? No Problem,” it’s an article about a new booklet produced by a nonprofit group named Zero to Three. You can get a free copy of the booklet“Healthy from the Start” by going to Zero to Three’s website. The feeding advice given in the booklet is intended to help with the problem of childhood obesity. 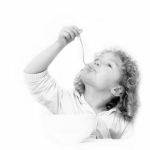 Unlike the all-too-common advice about carefully controlling a child’s eating, this booklet appears to recommend the more progressive approach that encourages parents to let children make decisions based on the child’s inner cues. Parents provide the food choices, and the child makes the decision whether he or she will eat or not and how much. This is advice first served up by Ellyn Satter, a pioneering child feeding expert, and someone worth listening to. Basically, she advises parents to take charge of their children’s food, allowing all things in moderation, but let children take charge of their eating. That is, encourage children to listen to their bodies and decide what’s right for them. If only we had all started eating mindfully in the first three years of life. Actually, a lot (most?) of us probably did. Then we fell victim to pressures to be thin, or to our hectic lifestyles that just don’t blend well with mindfulness. Either way, we can become mindful again. And reap the same benefits we hope for children who are just starting out. Our ‘start’ can be any day. One of the attitudes of mindfulness is ‘beginner’s mind,’ to "see the present moment, cultivate a mind that is willing to see everything as if for the first time and be open to new possibilities" (that from mindfulness guru Jon Kabat-Zinn). It’s like finding the child in ourselves again. I started thinking more seriously about that term “making the connection.” Excluding travel agents, it’s not a phrase that I hear others use often – I think Oprah uses it in someway (never have seen her show or read her magazine, no kidding), and I use the phrase to describe part of the process of getting your life in balance…but what does it actually mean in words (I know in feelings, but don’t think I’d be able to describe it). I did the internet-pokey, and came across a discussion about handling stress that sheds some light on what “making a connection” connotes to me – I found it interesting and enlightening, and hope you do to. Apparently, those that handle stress better than others have something called “hardiness” by psychologist that gives them the ability to ride through stress. The personality factors that stand out in stress-hardy people are love of challenge, commitment and control. In the following descriptions of each factor, I find that “making the connection” is well defined. Here is the list for your review. Having a strong commitment to self, work, family, and their personal values. A strong sense of commitment allows people to see problems through without being too disrupted by stress. Having a sense of control over their lives. They know they cannot control every detail of their lives (for instance, their supervisor's personality), but they see where they do have control, such as their reaction to their supervisor's personality. Generally seeing change as a challenge rather than a threat. Change is inevitable. When change is viewed as a threat, stress levels rise. By viewing change as a challenge, stress-hardy people avoid the stress associated with threats. Participating in activities that promote creativity and their own uniqueness. Having a strong network of support and close relationships. Believing you are alone in the world makes the effects of everyday stress much worse. These descriptions are found multiple places on the internet, so giving proper credit is a little hard. Hardiness , Stress , Stress Management , Making the Connection . Previously I wrote about the relief of giving yourself permission to do something for just a short time, The 15-Minute Miracle. That's the first step, realizing that it's okay to do something even if it's not perfect. I've been working hard to keep that kind of relief in the front of my mind. In addition, I've been subscribing to "No Chaos" living...one of my favorite supports for that is "Real Simple" magazine and website. They've read my mind with their "15-minute" series...here is an excerpt and link to the 15-minute Workouts. Enjoy the weekend in more than 15-minute intervals - but remember you can work in anything if it's just 15-minutes you're committing to! Andy Warhol , Fun Fitness , Real Simple , Diet Mentality . Make polenta and pour into an 8x8 pan that has been sprayed with PAM. Set aside to cool down. "Saute" onion and garlic in a little water until soft. Add bell peppers, and artichoke hearts, and then pour over passata. Stir to blend. Add capers, oregano and salt and pepper. Cover and simmer for 30 minutes. Turn the cooled polenta out onto a cutting board, and cut into bite-sized cubes. Put some of the cooked sauce on the bottom of a shallow baking dish. Place polenta cubes in a layer over the sauce, and then top with the mozzarella. Put the remaining sauce on top of the mozzarella layer and then sprinkle with some parmesean. Bake at 375 for 35 minutes. I get Sally Squires’ column in the Washington Post emailed to me each week, so that’s one reason I refer to her work a lot on this blog. The other is that she definitely covers topics of interest. Not always in the way I’d like to see them covered, but that’s not unusual! Nyers gets up at 3:45 a.m. and begins her commute from Southern Maryland at 4:45 a.m. She doesn't get home until 12 hours later. I know it’s easy for me to say because I’m no longer a part of the rat race, but a schedule like that, well…the person interviewed for this article is talking about how she gets the urge for a sweet snack in the middle of the afternoon. I think she deserves one if that’s what she wants! Before I get any strong reactions to that last comment, let me say first that it’s generally accepted that a carbohydrate craving in the middle of the afternoon in itself will not make or keep anyone fat. Usually there’s a lot of ‘stuff’ surrounding that snack that leads to overeating when it happens, and it’s not necessarily the stress of work or long hours (I’m really talking about attitudes and beliefs that get in the way of us eating what we want in moderation). Plus, I’d love to see what the rest of that person’s day looks like in terms of eating. Is she eating enough? Is it balanced? But it’s likely the bottom line really has a lot to do with what Sally has identified – a stressful lifestyle that would create problems for most of us in terms of eating and probably a lot of other things, too! One of the things I dearly wish for my children is that they don’t get caught up in this stereotypically American lifestyle. Even if they have to move elsewhere to avoid it. It’s plain just not good for us! Gisele Bundchen has now opened her mouth to insert foot over the growing debate around anorexia and high fashion modeling by saying possibly the stupidest thing I've heard in a long time. The 26 year old says, families are to blame for anorexia - not the fashion industry. "I never suffered this problem because I had a very strong family base," the supermodel told a local Brazilian newspaper on Friday. "The parents are responsible, not fashion." "Everybody knows the standard for models is to be thin, but you can't generalise and say that all models are anorexic." Now who's generalizing, Gisele? Such damaging statements by a fashion icon, stating that unsupportive families cause anorexia nervosa only perpetuates misconceptions and further stigmatize eating disorders. By the way, four women in Gisele's home country of Brazil died last month from anorexia, including 21-year-old model Ana Carolina Reston. Sometimes it really is better to be seen and not heard. Tags: eating disorders , runway models , anorexia , perfectionism . America Ferrera wins the Golden Globe for "Ugly Betty". Ugly Betty also won for best comedy. For mothers and young women out there looking for role models in a sea of spoiled, privledged starlets who seem to spend so much time partying they forget where they put their underwear, this 22 year old beauty is the real deal - a real American beauty…. For more information regarding young women and positive images in Hollywood visit: Turn Beauty Inside Out - Mind on the Media. Tags: self esteem and young women , Turn Beauty Inside Out , America Ferrera , Ugly Betty . A hearty hot soup on a cold winter day can’t be beat. But making it might take more time than we’ve always got. Try these ideas for a tasty and healthy soup in only minutes. A little creativity and a few extra ingredients can add extra nutrition and turn canned vegetable soup into a real treat! Check out the Green Mountain at Fox Run website for two other super soups: Tomato with Basil and Cheddar Cheese and Corn Chowder with Chicken and Broccoli (shown above). Combine all ingredients in medium sauce pan and simmer for a few minutes to blend flavors. Serve.